We classed the next 2 days as “Catch up days”. This was just incase we’d not done everything in the parks we’d wanted to. So we spent the morning at the Islands of Adventure. 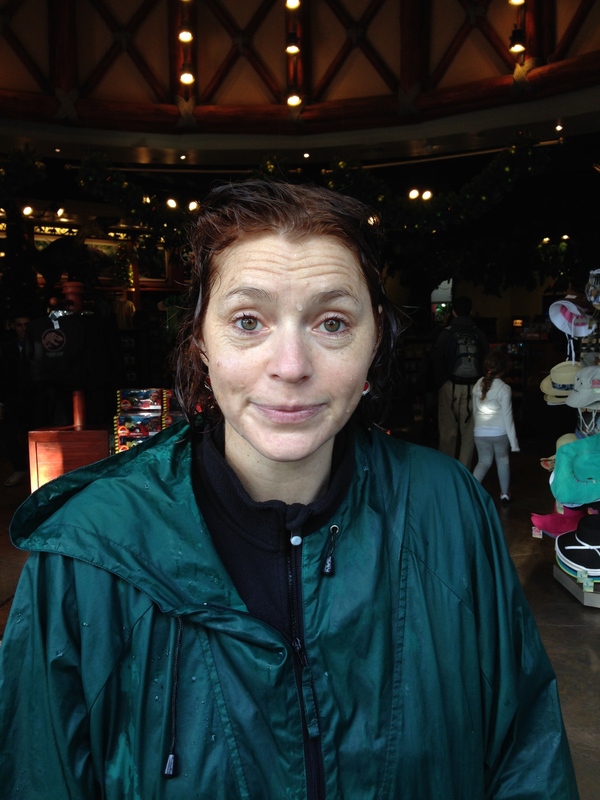 I was feeling rather brave, so told Mark and the kids that’s I would go on the Jurassic Park River Adventure. I’d taken photos of Mark and the kids going on this ride several times. You heard a massive scream and then a couple of seconds later a boat appeared and everyone got soaked. When we arrived at the park that morning, there was hardly anyone around, and we didn’t have to queue and got straight on a boat. I sat next to Mark, holding on very tightly to the bar in front. I had been warned that when you see the T-Rex then you drop. Oh, and the drop is 85 feet!! So we started going up a little ramp which already made me feel a little uneasy, then we dropped a couple of feet and gently floated past various dinosaurs. I was beginning to think the kids had made it all up just to frighten me. You then enter the Raptor area, and that is when it starts to go very wrong. You start to go up and up and up and up!! It goes dark and then there it is, the T-Rex head!! Oh, holy moly mother of God!! I swore all the way down. And before I could process what I’d done I was on the boat again!! How did that happen? I’m not sure if knowing what is going to happen is good or bad. But after doing it twice I was shaking enough and didn’t want to do it EVER AGAIN!! Don’t tell Mark and the kids, but I’m glad I did it…sshhh! Just a little bit wet! Mark and George them went on another wet ride and Emily and I watched them get even wetter. We then went to the Poseidon’s Fury show which was great fun. George got picked to help the man in charge, which he did with gusto. Then to readdress the balance we went on the High in the Sky Seuss Trolley Train. This was really meant for kids, but delicate little flowers like me too. Mark and the kids then went on the Flight of the Hippogriff Ride and I went shopping. We then took the Hogwarts Express to London or Universal Studios if you prefer. The journey takes about 5-10 minutes and is brilliant. Once at Universal we went to a Horror Make up Show, the Shrek show, the E.T Adventure, which wasn’t as bad as I’d been told. Although I hope that Steven Spielberg never does a film about E.T’s home planet. We then jumped back on the Hogwarts Express to take us back to where we need to catch our bus back to the hotel. 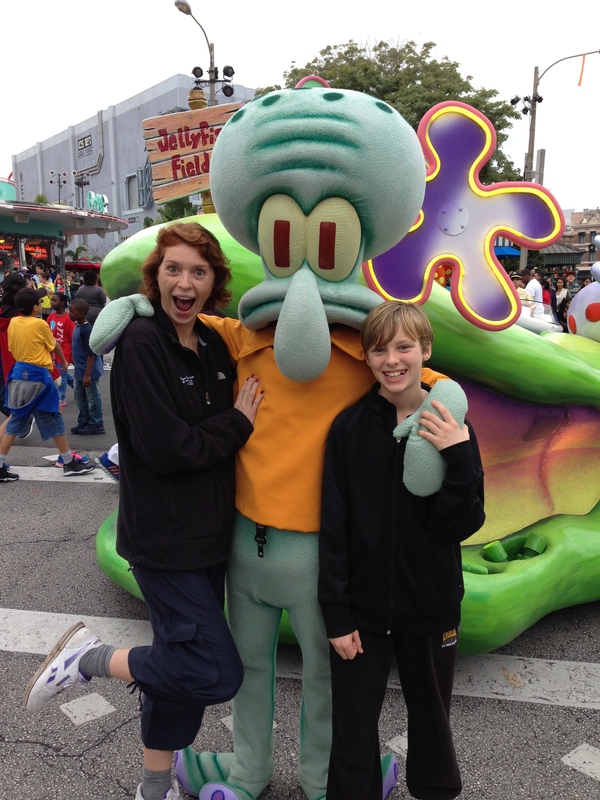 Oh, and I had my picture take with Squidward from Sponge Bob Square Pants. This entry was posted in Uncategorized and tagged claire's allotment, E.T, Flight of the Hippogriff, Harry Potter, High in the Sky Seuss Trolley Train, Hogwarts express, Islands of Adventure, Jurassic Park River Adventure, Poseidon's Fury, Shrek, Sponge Bob Square Pants, Squidward, Steven Spielberg, Universal Studios. Bookmark the permalink.